just wanted to add that by downclocking (for e.g. EOS 6D is 96MHz and could be downclocked to 12/ 24 / 48MHz) we might achieve ofc less write speed but this may become useful for cases where continuous write speed is not much important (time lapses?). Advantage is less power consumption in theory... According to the sdcard specifications this should happen if some old card (mmc in formware) is used. Should run at max. 48MHz automatically. UHS-I capable cameras need to be switched to UHS104 & SDR104 (bus speed 104MB) by using CMD6 function group 1. I found some CMD6 commands as stated earlier in ARMu. maybe someone can help to accomplish setting my 6D or any other UHS-I capable cam to the new bus speed by a CMD6 code switch? Ok need definitely help from one of you ML dev gurus on this. I spent again some hours to read through all official SD specification PDFs from V1.10 til 4.X and I can say CMD6 is all that is needed to set bus speed modes (SDR50 SDR104 DDR50 ...). There's one CMD6 SwitchCommand available in my 6D rom so it may be worth a try. Ofc this only works for UHS-I cards. I also simply guess that 5D3 is set to SDR25. a1ex tried once (see 1st page) but if something is done wrong then sd spec says that afterwards settings are defaulted and that's then SDR12. Wish I could help you...but have no idea how. "There's one CMD6 SwitchCommand available in my 6D rom"
....for example, only log those messages from CSMgrTask. and maybe SdioDrv can show what's going on in 6D logs. So some hints where i can define what is going to be logged would be helpful. Would that work for startup / "debug (don't click me?) and log some stuff related to SDCheckStatus or doesn't this make any sense to identify what's going on for other stubs? Any luck on this? Before I even read this thread, the only logical limiting factor I could find seemed to be that the software was limiting the hardware. Since the hardware should support the SDR104 standard, and since the voltage and all of the other requirements would remain the same, it really seems that simple. I hope this works out. At the suggestion of Ant123, I've ran ML under the Xilinx version of QEMU, which also emulates UHS. This revealed the missing bits from my previous patch: on 5D3, although it was printing a message about 96MHz, the card interface was set up in the same way as for... 24 MHz (which explains the previous benchmark results). Xilinx QEMU includes UHS emulation (along with some other nice stuff) and is based on QEMU 2.6.x (at the time of writing). Currently we have patches for QEMU 2.5.0 and 2.9.0, and for the Xilinx version, it will be something in-between. If there is interest, I can commit the patches. 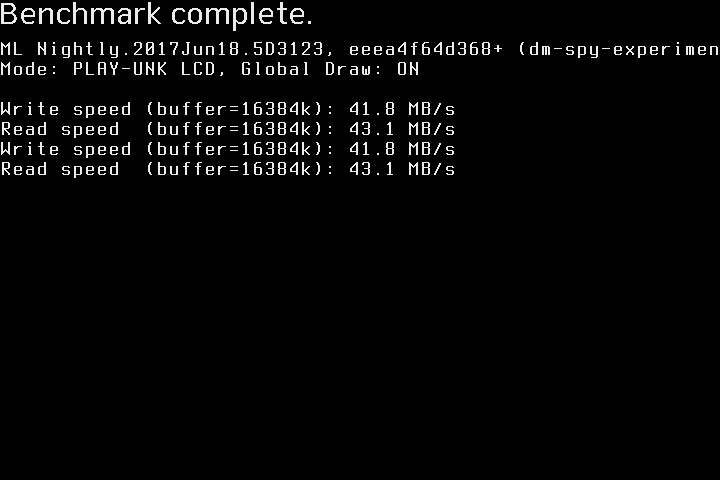 First, I've ran 5D3 1.2.3 from the dm-spy-experiments branch on both the camera and QEMU 2.5.0. Result. Now we can analyze how the SD initialization code configures the hardware (MMIO registers). This is as easy as specifying "-d io" in QEMU's command-line. Result. In other words, sd_setup_mode(4) appears to skip some hardware configuration it might be supposed to perform. With other arguments, it sets a bunch of registers, and the argument appears to be related to SD clock speed (3 = 48MHz, 2 = 24MHz, 4 = 96MHz). Let's see what it does on 700D. Result (also with a zoomed-in view). Notice some additional registers on 700D (highlighted in red on the zoomed-in view). What's up with them? The 0xC04004xx range is never set on 5D3, so these registers are probably specific to 700D hardware. Same for 0xC040063x and 0xC040064x. I didn't touch them. The remaining registers, 0xC04006x, are also set on 5D3, at other speed modes. In these other modes, their values are the same on 700D. You can see them here: sd_setup_mode(2), sd_setup_mode(4). My hypothesis was that 5D3's SD controller is UHS-capable, but for some unknown reason (could be even problems during the initial tests), Canon decided not to include it in the firmware. As a result, some of the UHS initialization code (hopefully a small part) was optimized out. So I've tried to take the missing register configurations from 700D. If you decide to try it, make sure you don't have any important data on your card. Otherwise, you will be playing Russian Roulette with your data (just like with my other SD patch). Does this apply to DIGIC 4 cameras? I'm afraid not - the hardware configuration of these cameras is different (and a lot simpler). You now know where to look, so you can play with it, attempt to change the clock speed and report your findings. Can the clock speed be pushed even further? I have no idea. Feel free to play with these registers, run the benchmarks and report. Can this be included in a module, to be used on a regular ML build? That's hard, because the hack must be applied before the SD card gets initialized by Canon firmware (in other words, before loading any module, and also before loading the config file). So, even if we include it in ML core, it will be hard to create an option for it. At the moment, the easiest way to try it would be a custom build. Probably best to start from the crop_rec_4k branch, as the backend support is there, and there is little reason to try this hack outside that branch. It might be possible to switch the SD to a higher speed on the fly. Didn't investigate this approach. How's this useful in practice? Other than raw video recording on both CF and SD at the same time (aka card spanning), it's probably not very useful. What's the maximum total speed (CF+SD)? Load the benchmarks module (bench.mo) to find out. How can I get similar results in QEMU? Take a look at this post. In a nutshell, it's the dm-spy-experiments branch compiled with CONFIG_DEBUG_INTERCEPT_STARTUP=y for the camera, and additionally with CONFIG_QEMU=y for running it under the emulator. These two will give logs that can be directly compared, and with the logging options from QEMU, you can get additional details. Then, look for CSMgrTask in the logs, compare them and try to understand what it does. Also refer to SD docs (summarized nicely by nikfreak earlier in this thread) to understand the initialization protocol. That's it. If you get stuck, just ask (here or on IRC). If there is interest, I can commit the patch for Xilinx QEMU and write a walkthrough similar to this one. Please note I no longer have the UHS card to do more tests (it wasn't mine), so from now on, what will happen with this hack is entirely up to you. Wow, so this means we can get another 30mb/s write speed. I would like to try it out. How is this in the other cams, like the 6d. I've always thought that UHS-I, 50 MByte/s (SDR50) was the limit here ? Or is there still a small chance that it can reach UHS-I, 104 MByte/s (SDR104) ? If you can not enter UHS mode with ML but it works without, read this topic. Most SD cards need to be reinitialized by switching off SD power if they already were in UHS mode. Let's try some overclocking: sd_uhs.mo (to be loaded on top of crop_rec_4k branch). Got the idea after looking into the EOS M shutter bug and understanding how clocks work - to some extent. See the source below for RE notes. Before and after. This is a slower card, compared to previous post. 5D3 only for now, tested on 1.1.3 with 2 UHS cards and 2 regular ones. Other D5 models on the todo list. Do not try pattern-matching the stubs for other models - it won't work. Only SD_ReConfiguration is generic code, the rest is 5D3-specific. No way man! Wow! Is this Day of Surprises movie? This is very large hope for doing continues 3K or just continues Slow mo on small cameras! And is there benefit by merging both SD + CF writes speeds for continues UHD and 4K for 5D3 ? So this is SDR50 at how much speed? Guess beyond 96MHz? 16 vs 24 MHz => 0x13 vs 0x1D. Exact ratio match with 0x14 vs 0x1E (setting registers to X-1 is a common trick used in Canon hardware). 24 vs 48 MHz => 0x9 vs 0x13. Exact match with 0x10 vs 0x20. 48 vs 96 MHz => 0x4 vs 0x9. Exact match with 0x5 vs 0x10. Overclocked: 0x4 vs 0x3 => 125% theoretical speedup. Benchmark result (read column): 54.4/43.1 = 126%. Check! => SDR50 @ 120 MHz. 0xC0400624 hi: exact match at 16/24 and 24/48, rounded at 48/96. 5/2/1.25 = 2 => exact match for the overclocked version? Underclocking test: 0x4 vs 0x5 => 83.33% speed => 35.9MB/s expected (matches my benchmarks). Porting notes will follow. Basic idea: place a logging hook right after these registers are set, to be able to override them. 5D3 does not configure these registers in UHS mode (likely optimized out in Canon firmware), which is why pattern-matching the stub won't work on other models. Registers are refreshed on every sdReadBlk/sdWriteBlk. SD_ReConfiguration will reset the card, including power cycling. My call to that function is not thread safe - do not run the overclocking tests while other tasks are accessing the card. Debug with qemu -d io,sdcf (or xilinx-qemu, but I need to cleanup and publish the patch for that). I always thought SDR50 was limited by host to 100MHz according to the screenshots I posted on page1. 120MhZ rather sounds like we have SDR104 - at least if canon followed official specs. Anyways as always great job. I encourage 5D3 owners to test stability and report their findings - ofc everyone wanna have this. If you got a unique way to handle / port this for Digic 5 cameras then don't hesitate to post it @a1ex. Actually, one of my UHS cards (a slow one, that writes at 15MB/s after the hack) refuses the overclocked settings, but handles the regular SDR50 and the underclocked one. Ant123 states to switch power off if already in UHS mode. Maybe he can comment on it. Just a guess but once we find out how to reinitialize the card it could probably also help with the eosm shutter bug - while extending boot times due to reinitialization. In 2014 while googling I didn't find host controllers which only support one of both modes. OK, I was wrong. Applied the SDR104 hack again and got another speed improvement! Does the SD card you're using for this claim a read speed, like the sandisks, 45MB/s, 80Mb/s, 90Mb or 95Mb/s ? It doesn't claim anything special, but noticed it can do about 70MB/s in the card reader, using dd. No luck with 160MHz yet. Is it possible to implement card spanning with the losslessly compressed 4K-crop recording modes on the 5D3? That would be a break through for this camera, I think, since it will provide much larger recording times at high resolutions. Ant123 states to switch power off if already in UHS mode. Maybe he can comment on it. What can I comment? Just read CHDK forum from here. On powershots the card is already in UHS mode while loading CHDK. So most cards can't be switched to UHS mode two times. Maybe on DSLRs the card is not in UHS mode while loading autoexec.bin and you don't need to turn off SD power.